Recently I went to see Matthew Bourne’s current touring show, Cinderella, at the Lowry in Salford. I am no dance critic, so if you want to read a proper review from someone who actually knows what they’re talking about I’d suggest the one from Judith Mackrell in the Guardian. I can only add that she is correct when she says that Liam Mower is truly superb as the Angel. The thought I wanted to capture here is my initial confusion about the setting. I couldn’t understand why Matthew Bourne had relocated the story to wartime London during the Blitz, other than to create a sense of difference for the audience in an effort to make it clear that this is a modern retelling and not the traditional fairytale. But then near the end it all began to make sense. After Cinderella and Harry have finally found each other in hospital and headed off to get married, there is a scene set at Paddington railway station. We are shown a busy station platform with couples waiting to part and others on their own waiting for someone to arrive. There is a prominent clock in the rafters set to shortly after 12:00. A railway carriage arrives at the back of the set, some couples meet, one person is left prominently on the platform sadly waiting for someone who hasn’t arrived. This is where the connection between Cinderella and the wartime setting became clear. Stories from the war, especially on screen, are full of meetings and partings. Couples waving a tearful goodbye at the train station, individuals waiting for the return that may never come. All governed by train timetable, by the station clock. This context is perfect for a re-telling of Cinderella, where the story revolves around a meeting, a parting dictated by a timetable, followed by an anxious rediscovery. The background of wartime Britain fits the Cinderella fairytale like a glove. This entry was posted in Art and tagged Art, Ballet on March 18, 2018 by 4harrisons. The latest major exhibition at Tate Liverpool covers the work of two significant twentieth century artists – Maria Lassnig and Francis Bacon – running until 18 September 2016. Walking through the show I was struck by the differing philosophies underpinning the work of each artist, despite a superficial similarity in the desire to portray the reality inside the individual rather than their physical presence. Lassnig’s work consists almost entirely of self portraits, each displaying a fascination with using the depiction of the body to express something beyond simple physicality. This is especially true of the “Figurations” segment, a series of paintings called by Lassnig “Strichbilder” or line drawings. Drawn while kneeling on the canvas they are (almost) recognisably portraits but the viewer is encouraged to see the process of creation itself. Throughout however it is clear that the focus is on the act of creation. In later works Lassnig continuously confronts the viewer, looking back at us from the canvas during the moment the piece was produced. This is art where in viewing the finished piece we are not just viewing an object but are also placed into the thought process and actions of the artist themselves. This feels similar in theory to some of the discussion in Boris Groys’ “In the Flow” on the nature of modern art. Groys describes how traditionally art was about the production of finished pieces for static viewing by others. By contrast in modern art there is instead a strong sense of performance, with the viewer a participant rather than a passive spectator. Art is something that happens in the moment. It may be recorded in some way and replayed later, but the art is in the act rather than in the product. For example in “You might come out of the water every time singing” by Kaffe Matthews where the audience sit on a vibrating platform listening to a recording of sharks swimming. The experience is immersive, and makes no sense as a ‘standard’ piece of art. Similarly in Cornelia Parker’s Magna Carta the significance of the piece is built on the people who created the embroidery, in the moment of creation. Lassnig’s work captures that moment of the performance experienced by the artist and encourages the viewer to reflect on her feelings at the moment of creation rather than necessarily enjoy the finished piece as a product in its own right. Francis Bacon’s work feels superficially similar – it also seeks to how the subject is thinking or feeling, their psychological state, rather than a visually true representation. And the frames which Bacon puts around his subjects, and which form the focus of this exhibition, focus the viewer onto the inner world of the subject. Bacon sees through the visible appearance to the true person below the surface, and show that to the viewer. In that sense, it has much in common with the aesthetic underpinning much traditional Byzantine Art. The objective is to show the person “as they really are” regardless of their outward physical appearance. Many of these images are arresting and disturbing, suggestive of internal torment. But this is in fact much more traditional portraiture. The viewer is presented with an image of the subject, and this makes for a strong contrast with Lassnig’s work. This contrast is intriguing, and the exhibition is well worth visiting, but the approach of these two artists do not perhaps sit quite as naturally together as might at first appear. This entry was posted in Art and tagged Art on June 8, 2016 by 4harrisons. 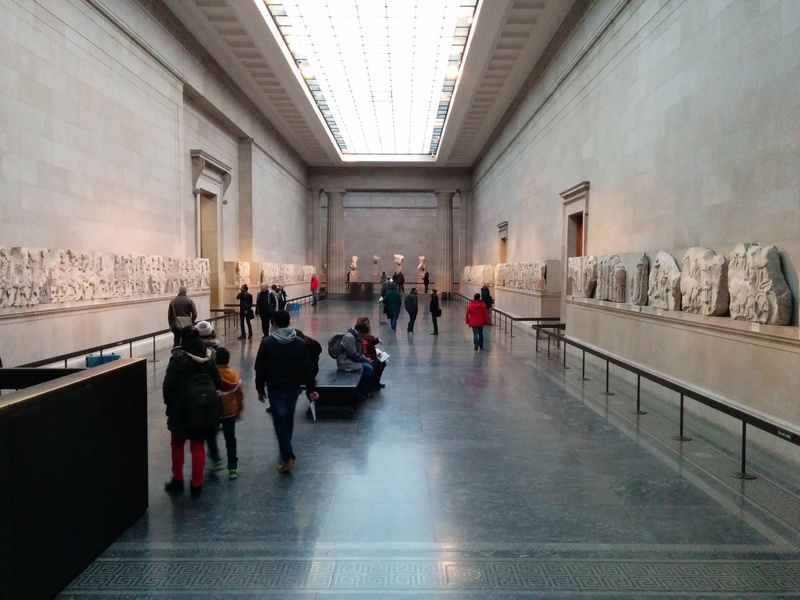 I recently snatched a couple of hours to visit the British Museum, including the hall containing the Parthenon Marbles. 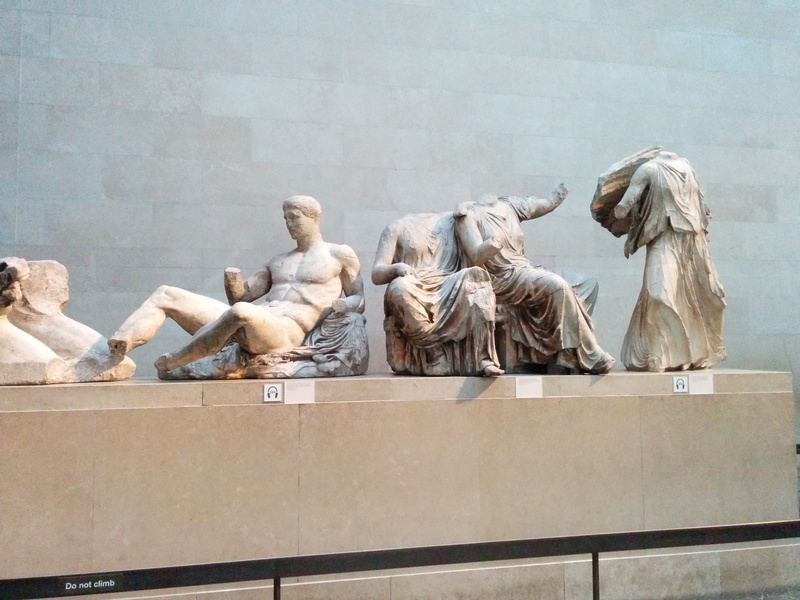 Beyond the campaign to return them to Greece where they belong I want to record some thoughts on the sculptures as art – especially as their artistic value as “world culture” is given as part of the reason for retaining them at the British Museum. Classical art is not my specialism, but it is clear that the ability of the sculptors to capture natural anatomy is astounding. 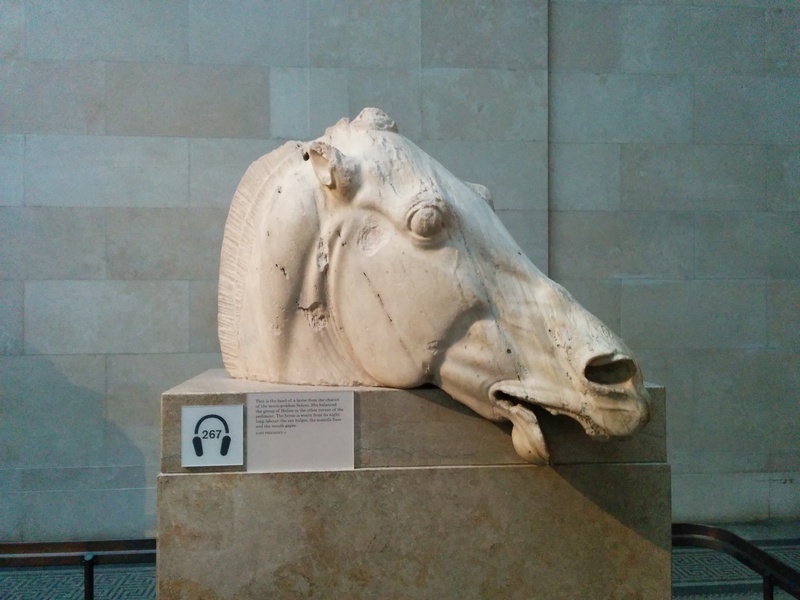 Individual pieces such as a horses head show a careful observation of physical form and highly skilled craftsmanship to replicate it in stone. The draped clothing of the individual human figures is delicate and highly realistic. The longer friezes around the walls of the hall show processions of people and animals viewed as if we are stood next to the cavalcade as it moves past us. Horses and people further from the observer are obscured by those in front. In other words, this is art which strives – and demonstrates virtuoso craftsmanship in achieving – a realistic depiction of what an observer might actually have seen if they had witnessed the events portrayed. But as the longer frieze scenes very clearly show this striving for naturalistic realism means that it isn’t always easy as an observer to understand what it is you’re looking at. We can see it is a procession, but any meaning beyond that is not so evident. Almost 2,000 years later, later Byzantine art has often in the past been derided for it’s lack of realism. Tucked away almost unregarded in a corner elsewhere in the museum a good example – the well known 14th century Byzantine icon depicting the Triumph of Orthodoxy. This couldn’t be more different to the marble sculpture from the Parthenon. The scene is flat and the two rows of people are depicted on top of each other. Clothing does not give a sense of being draped across a real human body underneath. The background is a simple field of gold. And yet we can see what is going on. The empress and her son are surrounded by patriarch and bishops venerating an icon in to celebrate the end of the destruction of icons. Similarly in the Assyrian friezes currently on display on the ground floor of the museum, flatter and less superficially ‘realistic’ depiction in fact does a much better job of portraying a particular subject. There are many other examples in Byzantine art. This is art with meaning, where understanding what we are observing is an important part of viewing it. This is a very different approach to art from the one we see in the Parthenon marbles – but I’m not at all convinced it is any worse. 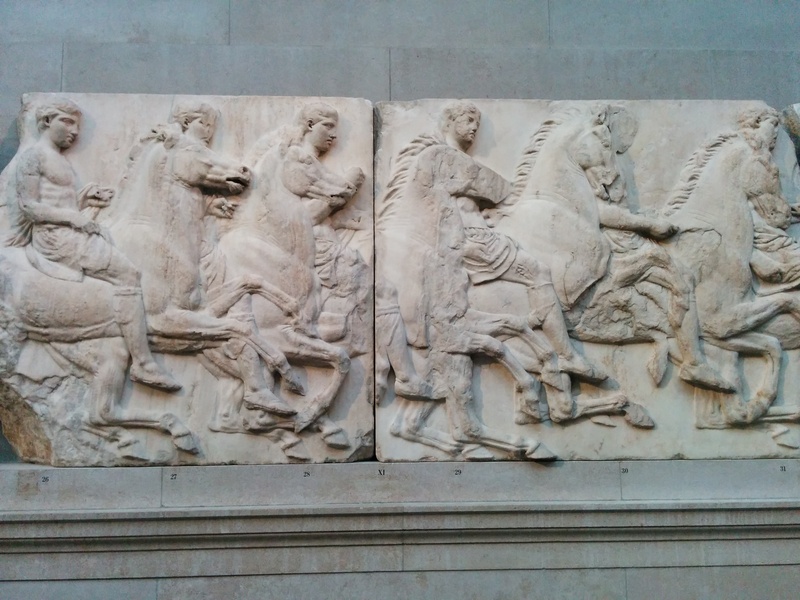 (And please support the campaign to return the marbles to Greece). This entry was posted in Uncategorized and tagged Art on March 14, 2016 by 4harrisons. I recently visited the Whitworth Art Gallery in Manchester again. On my first visit since it reopened I was really impressed by various pieces by Cornelia Parker. Part of my reason for this visit was to see Magna Carta (an embroidery). This work is an exact copy in embroidery of the Wikipedia page on Magna Carta as it appeared on the 799th anniversary of its signing. Originally in the the entrance hall of the British Library as part of the celebrations for Magna Carta’s 800th anniversary, it was on display at the Whitworth Art Gallery until 1/11/2015. At nearly 13 metres long and 1.5 metres wide it is an impressive piece physically, and the physical point is the first one I want to make. At the physical level the contrasts brought to mind are very thought provoking. This is a copy of a page from the internet with no real physical existence copied out using a medieval craft to create an imposing artifact. The page itself is discussing an 800 year old document of which very few copies remain in existence but might be said to ‘virtually’ underpin much modern legal thinking. So we have a modern but virtual document made physical using a centuries old technique discussing a medieval document whose modern existence is virtual. Quite deep! But the real magic is in hidden in the detail of the process of creation. The collaborative nature of Wikipedia is mirrored in the collaborative approach taken to the embroidery. Much of the embroidery was done by prisoners working with Fine Cell Work, a social enterprise which “trains prisoners in paid, skilled, creative needlework”. Here is one layer, the text is about a legal document defining basic freedoms but which has been created by those who are by definition not free. 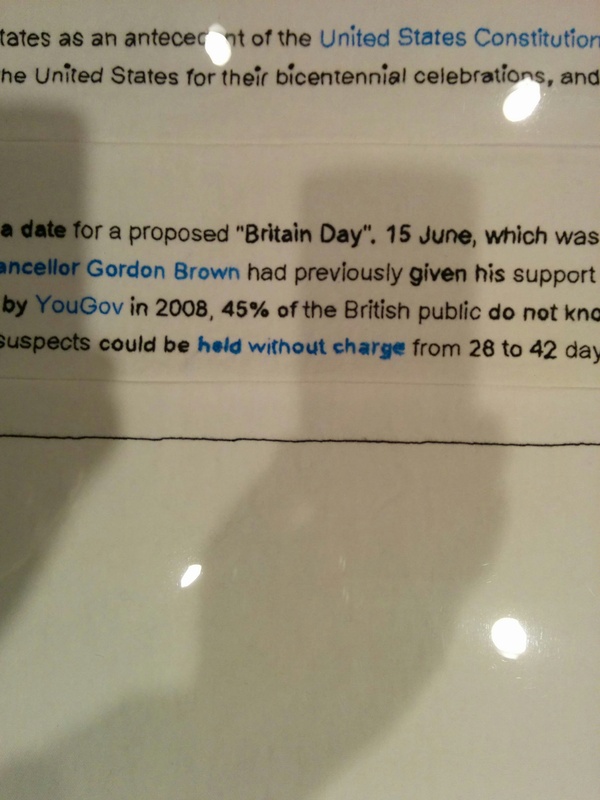 At the basic level of it’s creation the work highlights how Magna Carta doesn’t speak for the rights of many of us. “held without charge” embroidered by Moazzam Begg. Although the bulk of the work was done by prisoners, a number of individual words were embroidered by specific people. Each one challenges the viewer to think about the sorts of freedom protected by law, who is protected, and what the limits of that freedom might be. The full list is given on the Wikipedia page. So Julian Assange embroidered the words “freedom” and “ancient liberties”; Moazzam Begg (until recently a detainee at Guatanamo Bay) embroidered “held without charge”; Edward Snowden embroidered “liberty”; Shami Chakrabarti embroidered “Charter of Liberties”. There are many other examples, and each one prompts a train of thought around what freedom means in modern society, what freedoms are protected by law and in whose interests does that law work. This is the most thought provoking piece of art I have seen in a very long term, and well worth the visit to the Whitworth Art Gallery on it’s own. This entry was posted in Uncategorized and tagged Art on November 6, 2015 by 4harrisons. Recently I visited the current Jackson Pollock exhibition at the Tate Liverpool. Based on I admit very little actual experience, I had expected Pollock’s work to be very abstract indeed. In fact I was surprised by how figurative much of his work was. There is also a strong sense of motion, and that is what I want to focus on here. I was fascinated by the way in which Pollock uses a flat unmoving image to depict something fluid. The first piece I want to mention is one of the more famous works in the Ta te exhibition, “Summertime Number 9A” from 1948. A seemingly abstract frieze it also appears like a freeze frame, a dancer caught moving across the stage with each frame capturing a single moment in their movement. The sense of motion captured in a static image is unmistakable. A different work from 1950 maintains this dialectic of static movement. The untitled “Black and White Polyptych” is a monochrome display of paint dripped sprayed and splashed across each pane. Rather than a figurative image in motion what is seen here i s the movement of the artist themselves. The Polyptych captures the act of painting itself. The actions of the artist are visibly part of the work in a way not found in more ‘traditional’ art. The last piece is “Number 23” from 1948. The motion here is mo re fluid and controlled. The contrast between the two colours and the texture created by the use of enamel paint make each line stand out clearly. This is not figurative but it is very fluid, and put me in mind of the still frame flowing motion of “Summertime Number 9A”, but with the focus on movement itself rather than a figure in motion. The exhibition is at the Tate in Liverpool until October 2015. This entry was posted in Uncategorized and tagged Art, Dialectics on August 24, 2015 by 4harrisons. I recently visited the reopened Whitworth Art Gallery in Manchester, the highlight of which is an exhibition of work by Cornelia Parker. Three of the works in particular really connected to some of the books I’ve been reading recently – in particular to Slavoj Zizek’s “Absolute Recoil”. 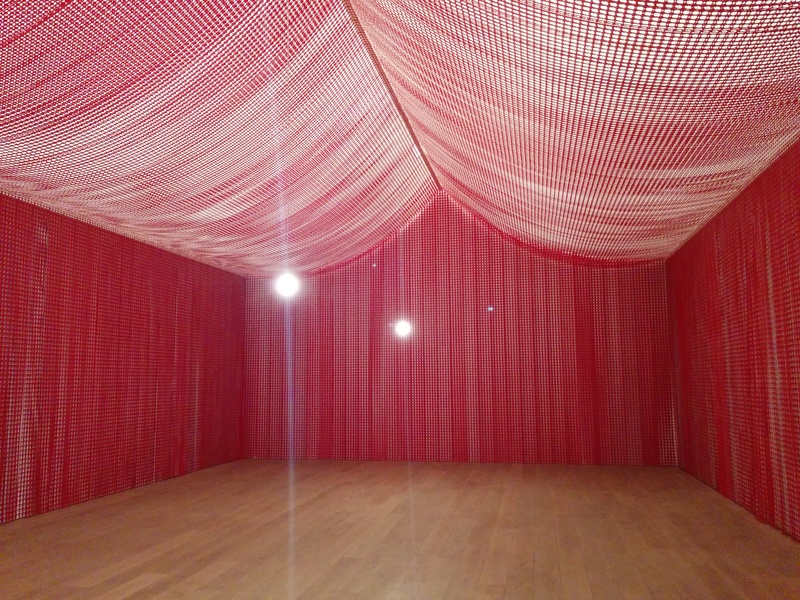 “War Room” is a room draped with what initially appears to be red fabric. The effect is a little like being inside a tent. The ‘fabric’ in fact turns out to be large sheets of what is left over after British Legion poppies have been cut out. The visual effect is mesmeric, inside the room feels quite disorienting. But it was the impact of what is left out, what is missing, that really struck me. The installation Blood Swept Lands and Seas of Red at the Tower of London uses visual poppies, but Cornelia Parker’s work creates impact through what is not there. All those missing poppies bring to mind the gaps left by all those who never returned from the war. They are more poignantly present by their absence than by the presence of the poppies at the Tower. The dialectic underneath the art is clear. “Black Path (Bunhill Fields)” and “East Jerusalem” are similar casts of lines between paving stones. Here again it is the impact of what is missing which is striking. Oddly, standing in the gallery there is a strong sense of the texture of the ground, even though there is a blank space between the outline where the paving stones ought to be. It is the absence again delivers a strong sense of presence and place. The last piece is “Cold Dark Matter: An Exploded View“, the shed which Parker displays suspended in pieces as if in the act of being blown apart. Is is suspended with the planks of the shed outermost and the objects from inside seen through the gaps, with a single light bulb in the middle. These throws strangely distorted shadows onto the outer walls. Despite the static, frozen aspect what the piece creates is a strong sense of motion, but not the motion of being blown apart. In fact the feeling is of a structure where the film has been reversed and the shed is in fact about to fly back together and reassemble itself. The sense of motion in stasis is overwhelming. If dialectics ever seem somewhat technical and disconnected from reality, then this exhibition shows how directly relevant they can be to the world around us and how we think. 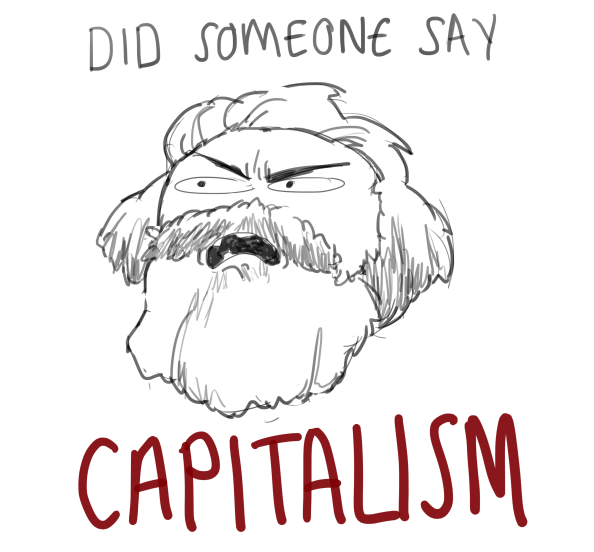 This entry was posted in Uncategorized and tagged Art, Dialectics on March 1, 2015 by 4harrisons.